Editor’s note: Tour of the Gila, a stage race that takes place in and around Silver City, New Mexico, is facing cancellation this year because a title sponsor had to pull investment. Jennifer C. Olson, who’s from Silver City and grew up around the race, makes her case for keeping it alive. Race background: “The Gila” consists of three road race stages, an individual time trial, and a criterium. Stage 1 is a point-to-point road race ending on a 6.7-mile climb that peaks at a 19-percent grade en route to the ghost town of Mogollon. The criterium is held in downtown Silver City with high speeds, 90-degree turns and a brutal climb. The iconic “Gila Monster” final stage consists of over 9,000 feet of climbing for the men and over 5,500 feet for the women, ending in the tiny enclave of Piños Altos, nestled in the Gila National Forest. I’m five or six years old and sitting on a street corner with my family—not just my parents and little sister, but also my grandparents, my uncle, and some friends. The street corner sits at the bottom of a hill, the curb itself rising at least two feet above the pavement to keep flash flood waters from flowing into the downtown storefronts. Hay bales are stacked in the street, forming a yellow bank taller than me that stretches from our corner to the one diagonal from us. A pack of really skinny men on bikes is flying down the hill, coming fast down the wide street, from the direction of the county courthouse toward me and then carefully into this hay bale-lined corner. It’s fascinating. Not because I understand what they’re doing but because I understand that the crowd is excited—making lots of noise with cowbells and shouts—and know that, for some reason, the skinny men riding bikes in a tight group are all eager to get around the corner ahead of everyone else, and without crashing. Sometimes, the riders do crash. And, I found out, that’s why the hay bales are there. When they crash, I am scared and sad. But them crashing seems to be a fact; a disappointment but just part of the game. The game is a five-day stage race in my hometown of Silver City, NM, during which professional and amateur cyclists alike climb thousands of feet over hundreds of hot and windy miles for the chance at a Mimbres-style pottery bowl and for the glory of competing in one of America’s most challenging and iconic stage races. After all the riders have survived the corner and after we have cheered on the stragglers, my grandparents announce that they’ve brought their ice cream machine to town. I love homemade ice cream and love getting to help drop rock salt over the churning ice, so I’m glad we’re going home. I never participated in the Tour of the Gila’s downtown kids’ race but seeing the little ones race in 2014 made me wish I had. At least there’s hope that my own children will ride down Bullard Street for a TOG trophy someday. Kelsey Brennan is my classmate now that I’m in fourth grade, because the fourth graders are in Bob’s class with the fifth and sixth graders. Kelsey’s one year ahead of me, but at our 100-student-strong Montessori school, the older kids have no choice but to befriend us baby fourth graders. I look up to Kelsey and think she has the prettiest legs. Her legs are light brown, and her thighs are thick and beautifully curved. I try to wear shorter shorts so my legs look full and pretty, too, but they never look as nice as Kelsey’s. It’s possible that Kelsey has such nice looking legs because her dad runs a bike shop and she spends time outside on bikes, but this concept doesn’t occur to me in fourth grade. 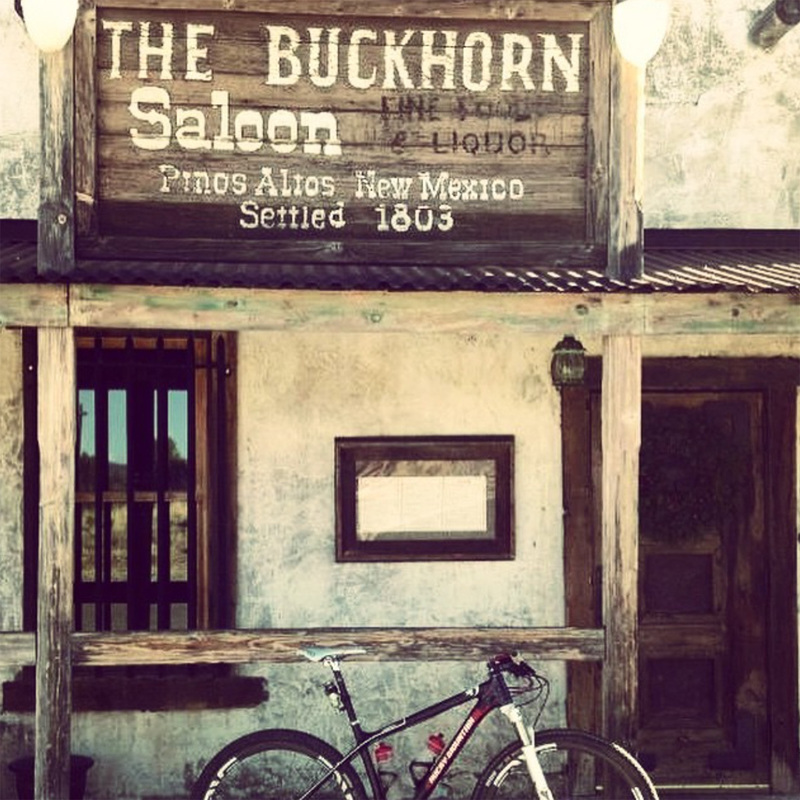 That shop, Gila Hike and Bike is, like corners to crit racers, just another fact of life in Silver City. All I know is that I want legs like Kelsey’s. To this day, I’m aiming to develop generous, tan legs like Kelsey Brennan’s legs in fifth grade. My dad has started riding a bike. I mean, we always rode bikes. We took them around the neighborhood after we looked both ways crossing the street at the end of our driveway and brought them to the park in the back of the truck and even rode around behind our Grandma’s house. But he’s riding bikes in a different way now and goes without my sister and me after work. 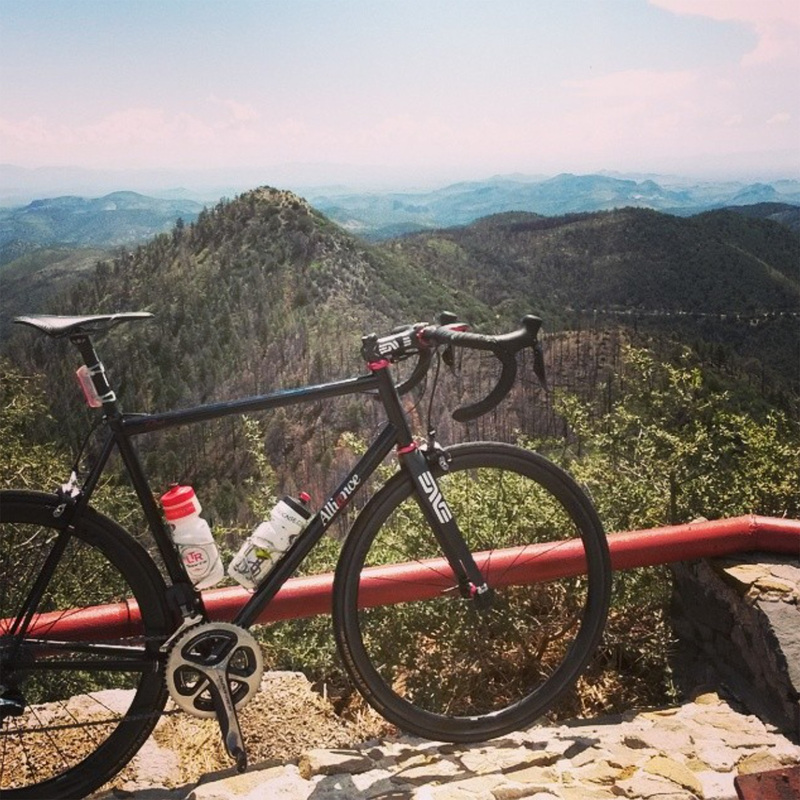 This spring’s Tour of the Gila must have inspired him to ride more and get in better shape. He even bought a new ride—a Diamondback mountain bike—and his friends are trying to get him to wear bike shorts. He got a seat cover padded with gel instead but they say that’s not the same. We’re at the Colorado Suzuki Music Institute with another family this June, and my sister and I spend most of the day going from one piano lesson to the next. But when we have a break, we take our bikes on the ski lift and ride from the top of the mountain down to our condo. Before we came here, my grandma gave me her old mountain bike so I could ride on trails. Yesterday, I almost crashed into a rock but missed. My friend Greg hit it and slid all the way down into the ditch on his back. Today, my dad, my sister, and I rode from our condo all the way around Snowmass and then back to the condo together on the trails. It’s the final day of the five-day Tour of the Gila, and my mom is kneeling next to my bed. She doesn’t always come in to say good night before I’m asleep because my dad always tucks me in. I’m relieved she’s here tonight because I have a question to ask her. As we watched the riders circle the downtown streets, I noticed that the racers—even the men—shave their legs. They have thick, strong, tan legs (like Kelsey Brennan’s legs!) and I want mine to look like that. I’ve been wanting to shave my legs anyway so this is the perfect chance to get permission. “Mom, please can I make my legs like the racers’ legs?” I ask. My mom didn’t give me permission but said maybe I can shave my legs soon. I joined the high school cross country team because I’m not very fast and always had to run the mile in middle school track. I also joined because I wanted to make new friends—friends who are less dramatic than my middle school gang. Running cross country in the fall is a lot of fun, but track wasn’t my favorite so I started playing tennis in the spring instead. I have decent enough tennis skills to travel to tournaments, which is kind of a bummer because it means that I’m missing the Tour of the Gila this year. Normally, I like to go downtown and watch the crit racers, cheer for the leaders, and look for cute guys in the crowd. Even though I don’t ride bikes much anymore, I think the race is exciting. It’s one of my favorite annual events in Silver City, but today we’re showing up after our tournament when the downtown races are almost over. I’m still in my tennis uniform and am sweaty and dusty and windblown, which I think isn’t ideal if I do see a cute guy. But then I realize that everyone who’s been downtown at the races all day is also sweaty and dusty and windblown. I’m resting on the curb with my teammate and happy that we’re here but disappointed that this is all we’ll get to see: the end of one race. As I get older and have more activities and responsibilities of my own, I’m missing out on a few things I still really like to do and see. This is the first year in memory that I haven’t watched the Tour of the Gila crits, and it feels like this year of life will never be complete without it. It’s been a long and tiring day, but I think I’d feel this loss even if I weren’t so worn out. I’m learning that I won’t be able to watch these incredible bike riders from other places compete in my hometown every year. My days of taking the Tour of the Gila for granted are over. National Geographic Adventure is sponsoring the Tour of the Gila this year, and my dad who now owns a local hotel and sponsors the race in a small way is driving two of their journalists in front of the men’s pro race so they can see all the action. I’m tagging along. As a high schooler looking to become a journalist, this is perfect for me. I can learn what they look for while watching the race and learn how they got that incredible assignment and, almost best of all, see a road race up close and personal. It feels like we’ve been in the car forever because cyclists go so much slower than cars on these flatter roads. We’ve already driven Highway 152 to the Mimbres and now we’re watching the pack pedal through the rollers in the valley toward Lake Roberts on Highway 35. Today’s stage (the fifth, final, and toughest one) will continue with a jaunt over a small pass and down to the end of a deathly curvy and narrow road where the riders turn around for a ride back over the mountain before continuing in a loop toward town with another soul-crushing climb (or three) between them and the finish line in the historic mining village of Piños Altos. We’re in my mom’s Volvo station wagon so I’m perched on a fold-down seat in the way back while the two journalists are sleeping up front. I can’t believe it and am pretty mad at them for blowing this opportunity. They’re not the sort of people I expected them to be—instead of looking grizzled yet intellectual, they’re both kind of fat and smelly and uninteresting. If covering this race were my job, I would be taking pictures and asking questions and writing the answers on my notepad. At least I can enjoy the moment without journalistic responsibilities. Going around these corners in the back of the wagon makes me laugh, because my dad thinks its fun and because we get to go way faster than the speed limit so the riders don’t catch up to us and crash. This is me riding through the Mimbres River valley between Lake Roberts and San Lorenzo. Tour of the Gila racers experience this road during stages two and five. We have several year’s worth of Tour of the Gila promotional posters displayed in frames at the hotel my parents own. If you walk through the lobby, you’ll see them. You’ll see the various title sponsor names big across the top and then a bunch of smaller sponsor logos down at the bottom. When school is not in session, I work at the hotel, putting out breakfast for the guests in the morning and cleaning the lobby, the offices, and the bathrooms in the afternoon. So I dust these poster frames and study who has signed them. This summer, one of the teams that usually races in Tour of the Gila held a training camp in Silver City, so I helped them get hot water for their oatmeal and let them use the microwave for their own healthy breakfast foods. TIAA-CREF is a pretty famous team, I’m told, and the one rider I talked to is super smart. He earned a degree from Harvard in just a couple of years and asked me a bunch of questions about myself and my own education, which was kind of him but also embarrassing since I’m shy and was just working in the kitchen. My dad has a friendly crush on one of the women bike racers. Kristin Armstrong is in town for Tour of the Gila this year, and he’s always deciding to be at the hotel when she and her coach are there so he can rehash the day’s race with them and get them to sign photos and jerseys for me and my sister. A classy competitor and a tough athlete, Kristin isn’t related to Lance Armstrong but is one of the most accomplished female bike racers in the States. She’s not on the team I always remember—Colavita/Cooking Light—but she’s on a team that’s good enough to help her win. Except this week, I’ve been at the State Tennis Championships and my poor dad has been in the hospital. His health conditions have gotten progressively worse since he was checked in. Aside from his recent extreme weight loss and severe back pain, he now is on several types of heavy-duty drugs but is still hurtin’, plus his blood pressure is sky high and he’s hallucinating. My dad hardly knows who he is and doesn’t seem to be connected to reality. His skin has a sickly yellowish tint, and since he sometimes forgets to breathe, he’s got oxygen to put up his nose if he can get the tubes positioned correctly. It’s Sunday and I’m at church while my mom is with my dad and my sister is sleeping at home. After the service, I want to visit the hospital to make sure things are being taken care of, and also want to go up to P.A. (local lingo for Piños Altos) where the final stage of the Tour of the Gila will be completed. But now my cell phone is buzzing and it sounds like my Dad’s kidneys have stopped working and he needs to get treatment out of town. I contact the rest of our family and then drive to the hospital. When the crew comes to load Dad on the stretcher, I leave the room so I don’t have to see his newly bony body squirm and curl up in pain. We walk with him out to the ambulance that drives him to the helicopter pad and watch him get loaded into the aircraft. By 2008, I’m racing bikes. It started with a fixed gear some college friends let me borrow occasionally. And it turned into triathlon ambitions. I’m training for a local sprint. My legs are thick, tan, and strong. They also require a lot more food than I’m used to eating, but I don’t mind. The weekend is finally here. The 23rd annual Tour of the Gila is in full swing, and my two best girl friends and I are driving down to Silver City from Albuquerque to volunteer and spectate. As a collegiate racer, I’m more excited than ever for 2009’s race. It’s been a while since I’ve been able to visit Silver City during the race, and this year’s a good year to come because Lance Armstrong will be here. My dad is stoked. Lance is a cancer survivor, too. The two girl friends I bring aren’t the only ones crashing at my parents’ house. My triathlon coach who’s now a close friend is staying here, along with his cycling buddy from Colorado. Both of them are named Brent. Both of them have already been adopted by my dad as the sons he never had. And the Brent I’m just now meeting is kind of cute. He has a Euro mullet, like all the guys on the Land Rover team. And he has terrible sunburn on his lower back. I guess wearing bibs isn’t his thing, and this high-altitude New Mexico sun did a number on the gap between his chamois and his jersey during days one through three of this Tour of the Gila adventure. I offer him some aloe vera gel to calm the redness and ease the pain, but this mullet-headed man who barely speaks refuses my girly potion with a crinkled brow. A video crew approaches us on the crit course also. “What do you find attractive about male cyclists?” I studder and search for the words. What do I find attractive about men with weird tan lines who exercise for a meager living? “Is it their twiggy arms?” the video crew prompts. The three of us laugh. 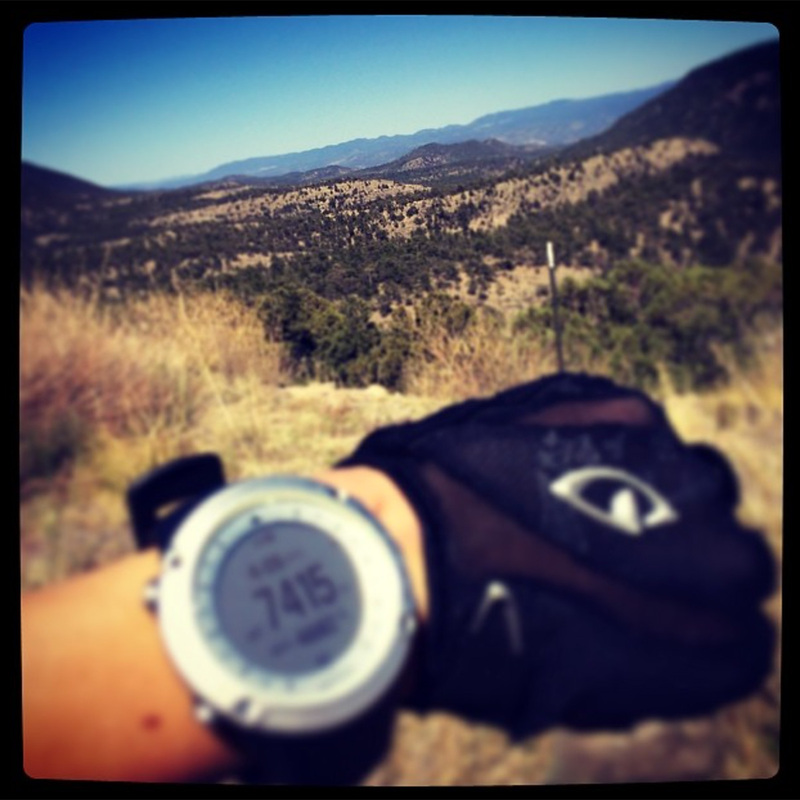 Racing for five days under Southwest sun means that UV protection is a must. Faux tattoos are optional but make things extra fun. I’m about to graduate college the next time I visit Silver City for Tour of the Gila, and I’m standing with my mom at the start line of stage one in 2010. Once the gun sounds, a tall man who’d been taking photos and holding a microphone for riders giving last-second interviews walks by us and nods “Hi” to my mom. She point him out, telling me that this guy has a pretty rockin’ job and that I should meet him. I learn that he does public relations for a bike component company, that he gets to write about bikes and people who ride them—full time. I think that sounds pretty wonderful. My mom can tell. She mentions to him that I’m graduating from journalism school soon, which is embarrassing for a second but I feel happy that I know this person with a dream job now and feel more connected to the race right away. Then someone I actually know professionally appears. 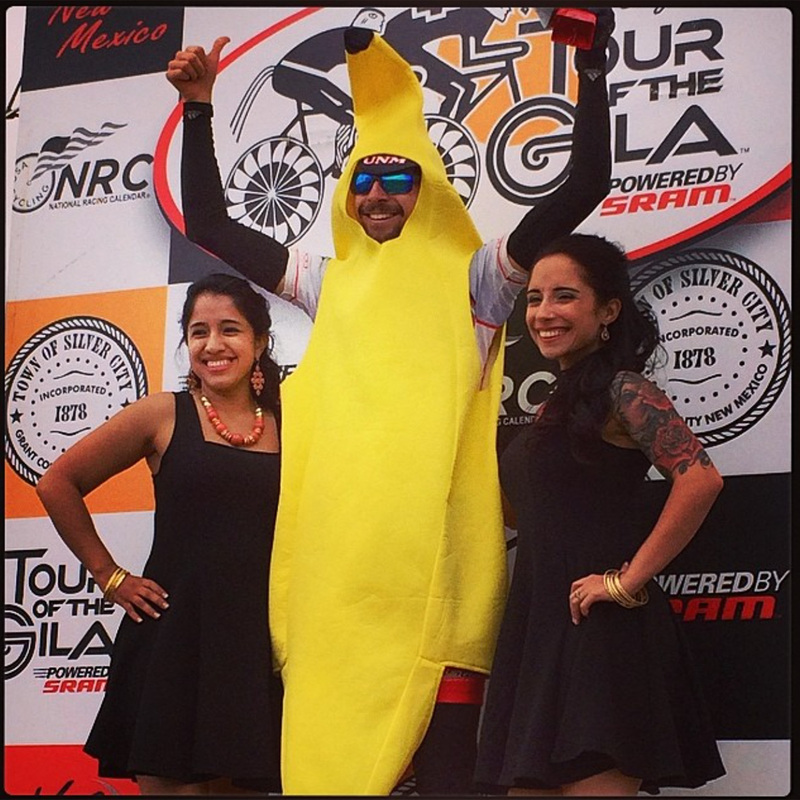 I’ve been writing awful (really, don’t go read them) race reports for VeloNews’ website and working with a cycling journalist who loves covering Tour of the Gila who happens to be here this week. Before traveling here, we made an arrangement: he’ll let me tag along with him for a couple of days. That morning, I get to hop in the media car as a media passenger. My first assignment comes less than two miles from the finish line near the mountain community of Mogollon. The assignment was to interview Lance Armstrong. I just had to get a quote, any quote, before he left the scene. At the finish line, I don’t get a single word. Lance finishes the race at the top of an excruciating seven-mile climb, grabs his wind jacket from a team manager without ever fully stopping, and immediately heads back downhill, bombing down those curvy few miles of a 19% grade without having spoken to even one journalist. Interview failure aside, I learned so much—that you can write a story for a cycling website about the podium girls (specifically, about their tattoos) and that it’s possible to compose a race report that offers all the race results but zero insight into a race. That’s what the photographers on motorcycles in the mix of each race are for. No race report–even the most skillfully written and detailed—can perfectly depict the steepness of this area’s mountains, the brutality of Grant County wind, the diversity of Silver City’s volunteer force, or the artistry that goes into the race’s hand-painted trophy bowls. As someone who travels to bike races on a weekly basis, I can now say that the character of Tour of the Gila is matchless. No one who leaves this southwest New Mexico stage race can say, “It’s just a race, just another chance to push my bodily limits, just another week of riding my bike in a new place.” It’s not like any other stage race in the world. 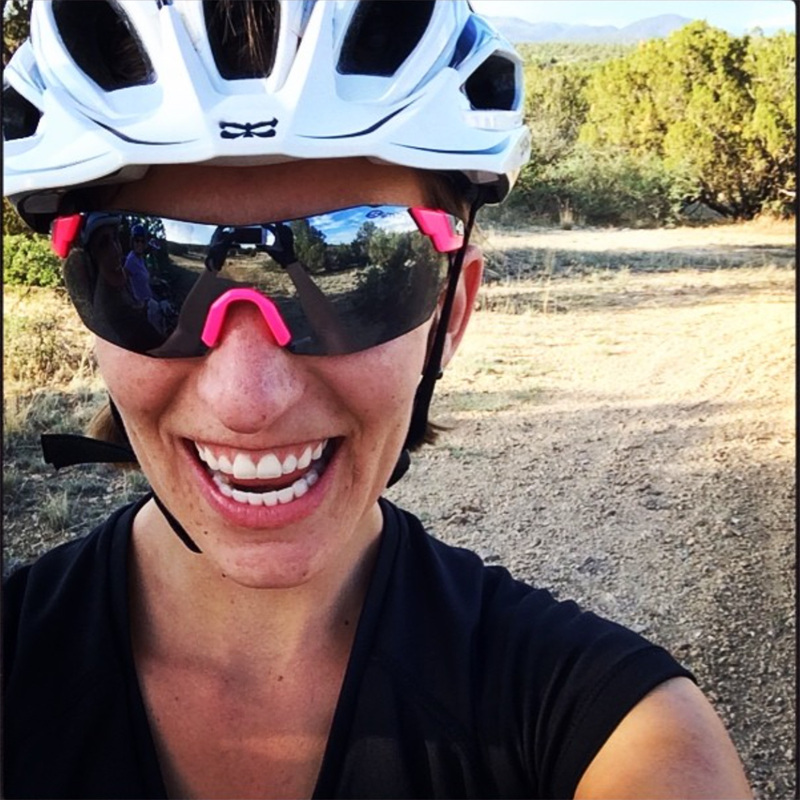 Because I’ve raced bikes, written for VeloNews.com, bike toured the Pacific Coast highway, and am willing to relocate, I will land a job in Boulder, CO, after getting my Communications and Journalism degree from UNM. My job will be to write about bikes and people who ride them. Almost full time. In 2011, I decide to drive the 12 hours from Boulder to my hometown for the race. Looking for Tour of the Gila sponsors was one of my dad’s favorite hobbies in life, and the race directors will honor him for his help at the Saturday crit races. Somehow, I’ve befriended Tour of the Gila’s usual announcer, the commentator from Boulder who I’ve always seen as a world above me, and it looks like I’ll be giving his bike a ride to Silver City. Before me and the bike leave, though, there’s one thing to do. I’m about to buy a new bike of my own. After borrowing a family friend’s road bike for years and almost losing it while bar-hopping in Boulder, I’m demoing a shiny women’s Trek. And Dave helps me evaluate it. 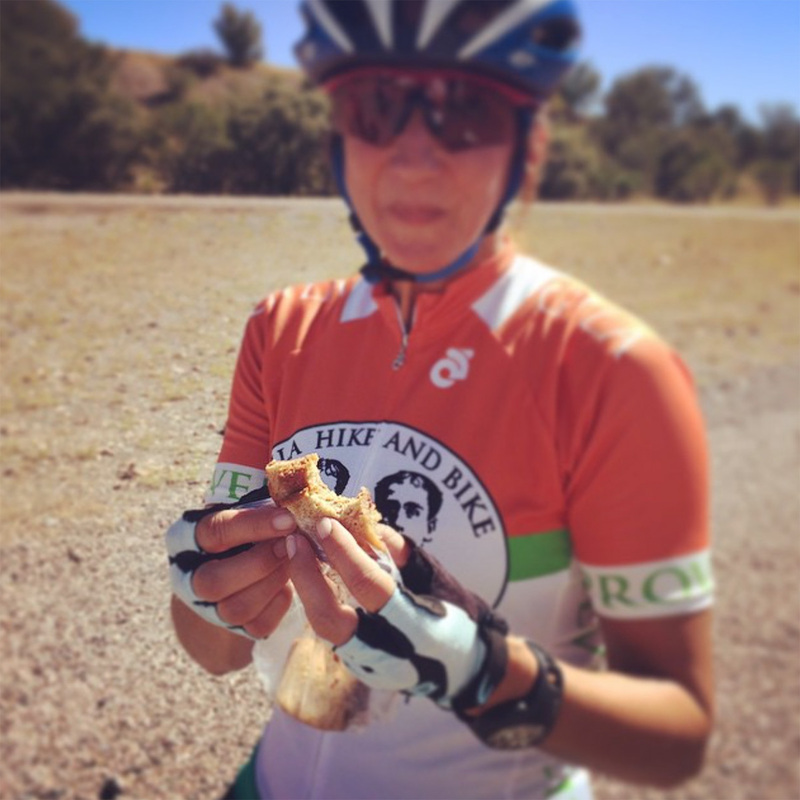 We ride up to Jamestown, where the thing to do is stop and buy a cookie before continuing your ride, and I stay in my big ring for almost the whole climb, which really cracks Dave up. He says the bike I’m demoing is my perfect size, so I buy it and bring it home to Silver City. This Trek is the discounted demo I bought directly from the manufacturer with Dave Towle’s advice in mind. I’ve stolen my fiancé’s carbon wheels as a not-so-temporary upgrade. Living in Colorado means I get to see more of my Euro-mulleted friend. His mullet is gone and he’s skinnier than ever before, which I don’t love. But this Brent is still kind of cute. I go to the Vail Mountain Games. He comes to race. I go to Grand Junction for some springtime mountain biking and run into him at a party. I watch the U.S. Pro Cycling Challenge. 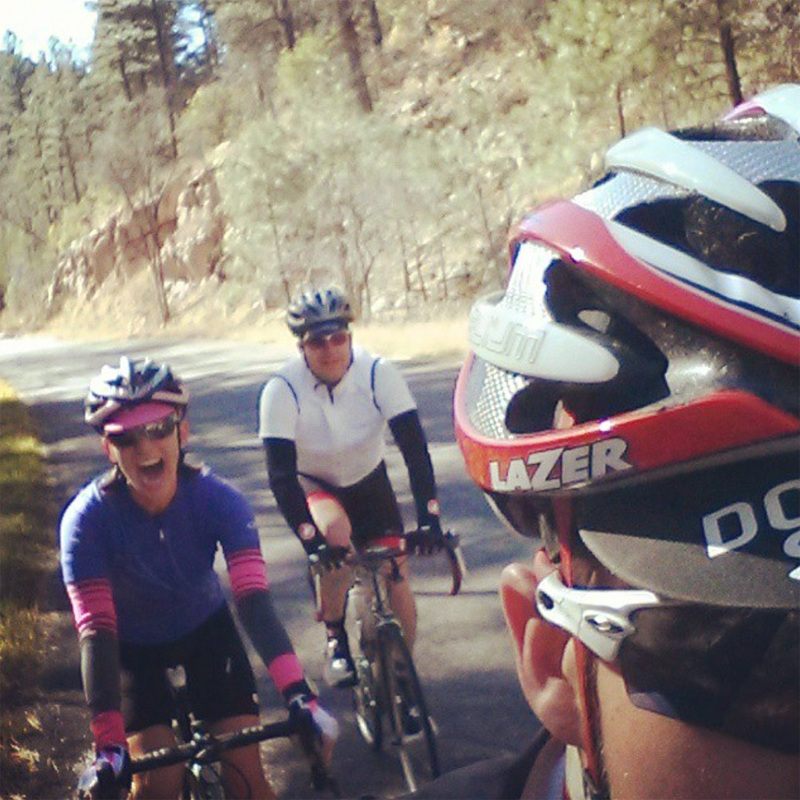 He crashes at my house and gets tipsy with my friends while we cheer racers up the Flagstaff climb outside Boulder. We go skiing and hut tripping in the winter. We become a couple. Replying from my new boyfriend’s couch, I say that I’m mountain biking in Fruita instead. That doesn’t satisfy the roadie on the other end of the phone, but I’m in love with bike riding in any form—and with this man whose couch I’m enjoying in Colorado. My man is a Silver City resident now, and we’re testing on our bike buddies’ tandem during a music festival Memorial Day weekend. 2012 is coming to a close, and I’m on my own couch in Boulder with Brent. It’s hard to believe that he’s the man I met during Tour of the Gila’s 23rd year and the the man my dad adopted as an honorary son that year. But he is, and he’s the man who’s now telling me that he would move to Silver City with me if that’s what I want. We’ve just returned from a cancelled hut trip during which I’d felt anxious and after which I answered a call I’d been half expecting: “Dad got hurt.” That alarming feeling that something is off shouldn’t be ignored. Less than a week later, my bags are packed for a weekend trip to Brent’s side of the state. 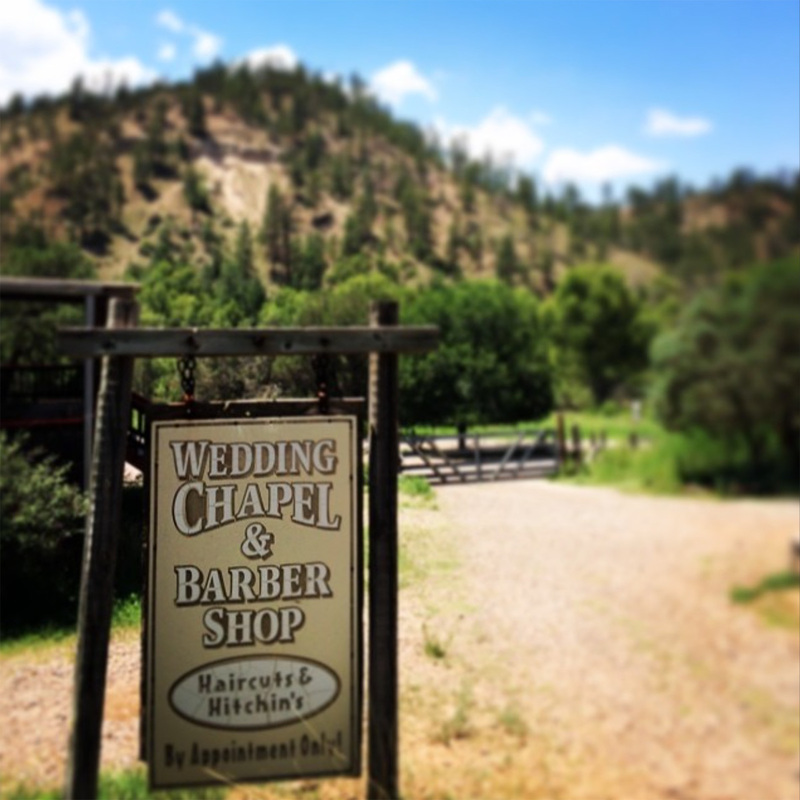 But that morning, I get another call and add a black dress to the mix before I begin driving toward Silver City. When Brent shows up at my mom’s house a couple days later, he has bikes in tow and immediately begins exploring. I know that emotional matters like death aren’t his forte and that he needs outside time to stay sane. But I’m jealous. I wish I had a bike with me, too. 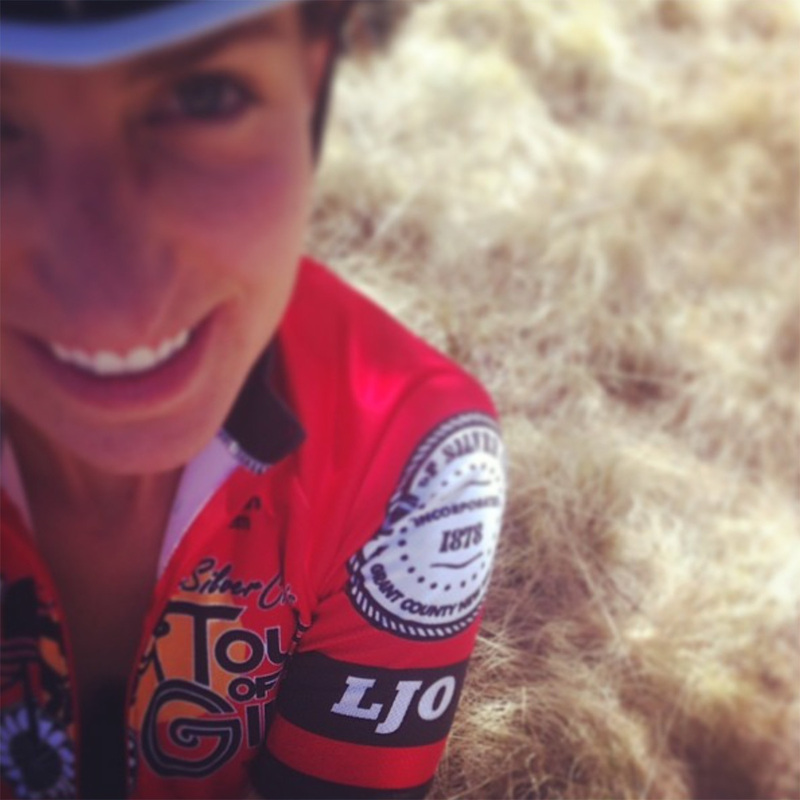 I will always treasure Tour of the Gila’s 2013 leader jerseys. My dad’s initials, LJO (for Leland or “Lanny” Jon Olson), appear on the left sleeves of each. I can’t think of or imagine a more public and appropriate tribute to his work on this race and know that he’d be proud of how it has grown since he’s been gone. Tour of the Gila race director Jack Brennan (and, yes, beautiful-legged Kelsey’s dad) got a visit from my dad one day on the mountain bike trails. He’d been riding too damn slow, apparently, and LJO let him know. But since Jack’s recovery from a blood clot last year, he’s been in fabulous shape, blowing everyone out of the water. Maybe that’s why my dad hasn’t come around. Almost ten years after riding in the media car my dad drove in Tour of the Gila, I am behind the wheel. “You’ve done this before, right?” my passenger asks as we roll off of the start line in 2014. “No. Well, yes,” I stammer. I haven’t. But I know where to go, what to do, how to handle it all. It’s not my first Tour of the Gila. In 2014, I co-hosted a showing of Half the Road, a documentary about women’s professional cycling by journalist, advocate, and Olympic-level racer Kathryn Bertine. The screening raised a whopping $250 dollars toward the goal of a UCI women’s race at TOG in 2015. Early last year, when I first moved back to Silver City, Jack asked me—the editor of Women’s Adventure magazine—whether I knew of any women’s brands with money to spare. He was committed to offering a UCI women’s race in 2015 (in addition to the men’s UCI race) and just needed the funds to make it happen. This past fall, he announced that Tour of the Gila would be a place where pro women’s teams could earn Union Cycliste International points leading up to the 2015 World Road Cycling Championships in Richmond. He wasn’t sure where the money would come from, but Jack was confident it would show up. Except the sponsorship efforts haven’t yet been as successful as they need to be. This week, the entire Tour of the Gila is facing cancellation. Unless someone steps up. For the past 28 years, Silver City, New Mexico, has hosted one of the most iconic bicycle stage races in the United States. The TOG is…the American road cycling stage race where “Champions are Discovered™.” Over the past three decades, the TOG has grown into an international road cycling race; equally important to major pro teams as it is to many, many domestic amateur clubs. With this mix of participants and the authentic, small-town Southwestern community backdrop, the TOG…is one of the only cycling stage races in America that’s both attainable and aspirational. Riders of all categories share the roads with the pro teams over the five-day stage race. Earlier this week, the race directors of the TOG received word that a title sponsor had to pull investment. Because of this, the 2015 Tour of the Gila, which begins April 29, may not happen. Race directors are officially putting out the call to action to draw in angel sponsors to help Silver City pull off one of the greatest American road cycling stage races in 2015, offering Union Cycliste International (UCI) sanctioning / points. This year’s race is already tracking to be the strongest participation globally and internationally of any Gila in the past. The race still has a chance to continue for amateurs and pro riders. Without this title sponsorship, over 600 racers will not be able to experience this bucket-list cycling goal. What’s more, small business owners and community members in Silver City, New Mexico will go without this major tourism draw that has incredible global reach. Arguably the toughest race that most serious amateurs will ever get to experience, the Tour of the Gila is also the toughest race some domestic pros will face. For 28 years, the U.S. racing scene has kicked off with a grueling week of climbing, battling wind, and competing in an area so remote that cell service is unavailable during three of the race’s five stages. Without the Tour of the Gila, hundreds will miss out on this training opportunity and thousands will miss out on the economic opportunity the race provides Silver City annually. Over the course of five days, the absence of Tour of the Gila would translate to $25,000 of lost revenue for my family’s hotel alone. Ordinarily, our rooms would be occupied during the week so the loss isn’t as large as the drop in revenue some lodges will face this spring. Silver City—a poor community with lots of potential—could use this annual influx of tourism money. But more than that, it could use the influx of culture, healthy living, and opportunity. How many youth in Silver City will miss out on the chance to meet a public relations professional in the cycling industry, miss out on the occasion to shadow a former AP journalist, and miss out on the opportunity to learn about the sport that’s replacing board rooms, golf courses, and conference calls this year? For more information on securing title sponsorship of one of America’s classic road bike stage races, please contact Jack Brennan at 575-590-2612. My fiancé and a friend of our have a slow race to the finish in Piños Altos, where stage five of Tour of the Gila concludes.